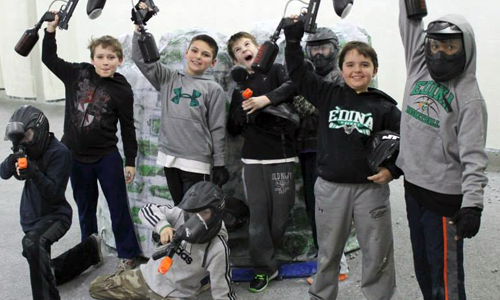 Splatball Minneapolis is the ideal venue for your next corporate event, bachelor/bachelorette party, youth group, birthday party, family reunion, or an incredible day with a bunch of friends! Recreational players are our specialty. We’re the oldest paintball field in Minnesota! The playing field is spectator friendly so even non-players can enjoy the action through sideline windows. The facility has a large staging room for your convenience. Ask about bachelor, bachelorette and birthday party deals! Don’t have a group to play with? Want to meet other players? Check out our regular Open Hours–this time is great for small groups and first time players! Open Play works just like a big pick up game of paintball. We mix both new and experienced players together to form teams and have fun all day! Your Referee is your guide to a great day of paintball at Splatball. They’ll take you through a new player orientation and safety briefing, teaching you everything you need to know about how to play paintball and how the equipment works. Once you’re geared up and ready to go, your Referee will accompany you on and off of the paintball field. Our staff will be there to officiate your games, ensure safety and fun! Reservation: Use our easy online booking system, click on “Reserve online” tab to get started! Schedule: Schedule your game for a time that’s convenient to you! Time Limit: There is none! Stay as long as you like! Additional paintballs are always available for purchase to keep playing! We are capable of running private games 7 days a week, 24/7! If you would like to make a reservation outside of our normal open hours please call us at 612-378-0385!